Who doesn't want to blame all the problems Israel/Palestine is facing on newly appointed Israeli Prime Minster Benjamin Netanyahu? He refuses to endorse the internationally recognized two-state solution, he is far more combative on settlements than his predecessors, and he has formed a coalition with right-wing racist and advocate of forced transfer, Avigdor Lieberman. Listening to the chatter in "liberal" circles, it seems that the stagnation of the peace process is reinforced not only by Palestinian extremists in Gaza, but by Israeli extremists as well. This current stagnation plays into the argument that if moderates were in power (i.e. Palestinian Authority President Mahmoud Abbas and Kadima leader Tzipi Livni), newly elected U.S. President Barack Obama could make the desert bloom with new handshakes and peace processes. Once Israelis and Palestinians see how serious Obama is, they will trade in their current devils for the angels of old. This argument dangerously dismisses significant realities. Mahmoud Abbas' mandate as Palestinian Authority President ended on January 9, and he is increasingly seen among Palestinians as a Western and Israeli quisling willing to do anything necessary to maintain power. Secondly, Netanyahu and Lieberman didn’t just stumble upon the 42 Knesset seats their respective parties accrued in last February’s election. Both men represent a considerable and rapidly expanding sector of Israeli society. Moreover, the tone of the Israeli mainstream has shifted further to the right: 94 percent of Israeli Jews supported the war on Gaza; the youth staggeringly embraced Lieberman's extreme right party, Yisrael Beiteinu, in mock elections across ten high schools in Israel; and in a Jaffee Center for Strategic Studies poll, 60 percent of Israeli Jews favored encouraging Palestinians to leave the state. The shift in public opinion among Israeli Jews bolsters a foundational position embraced by the vast majority of Israeli society and concomitantly endorsed by Obama himself: the preservation of Israel as a Jewish state. To maintain its Jewish character, Israel must continue to relegate 1.4 million indigenous Palestinians to third class status, employ a set of swiftly expanding discriminatory laws, and refuse the right of return to Palestinians dispossessed from their homeland in 1948. This is not a position that can be nuanced or negotiated; under these circumstances, a Jewish state is anathema to democracy. The third and most significant reality is that Hamas was democratically elected. Whether Washington likes it or not, Hamas still retains legitimacy in the occupied territories, is viewed as less corrupt than Fatah, and since the January war, has strengthened in popularity polls among Palestinians in the West Bank and Gaza. While politics may dictate Obama’s decisions, imposing rule on Palestinians is not a road to freedom, but rather a set up for failure. 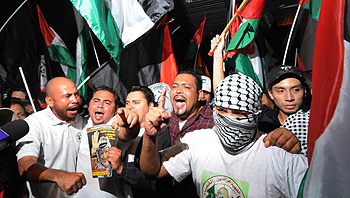 In addition to Washington’s tired strategy being an affront to democracy—and proving to be a complete disaster during the Bush years—it will do little but further stoke tensions and violence between Hamas and Fatah. Furthermore, receding back to Camp David 2000 or the inane Oslo process, where on-the-surface issues of occupation were heralded as the only grievances, does little but put a band-aid on a patient needing an amputation. Contrary to conventional wisdom, it is not "liberal enlightenment" that sparked the renewed push for a peace process, but a fear that time may be running out to grab large swaths of land without significantly affecting the Jewish demographic of the state. A number of left-leaning Jewish organizations advocating a two-state solution, such as the Israel Policy Forum (I.P.F. ), proclaim that such a solution is in the interests of the Jewish state. Promoted as a left wing alternative to the right-wing A.I.P.A.C., its stated goals appear eerily similar to the latter’s modus operandi. In a full-page ad taken out in the New York Times addressed to President Obama, I.P.F. laid out the urgency for a two-state solution. While there was discussion of ending settlements and "superfluous checkpoints," a notable bullet point emphasized Israel's "security." In particular, one section read, "The number of American-trained Palestinian security forces in the West Bank must be increased and their role in preventing violence strengthened." This loosely translates into arming and training Fatah against Hamas, a disastrous Bush policy that played out on the streets of Gaza with Fatah's former national security adviser, Mohammed Dahlan, fleeing the tiny strip with his tail between his legs. Omitted is I.P.F. 's commitment to a Jewish state, which does appear on their website stating, "More and more people in the region are talking seriously about other options, particularly the one-state solution. The resulting bi-national state would end Israel's Jewish and democratic character, and destroy the primary rationale for Israel's existence: to serve as a national home for the Jewish people." The central focus of I.P.F. 's position, as well as that of nearly all Israeli politicians and the Obama administration, is on a conflict rooted in a post-1967 occupation, whereas Palestinians worldwide are shifting the debate back to the Nakba, or Catastrophe, of 1948. It is not simply how Israel conducts itself as a state, but that the concept of an exclusivist and prejudicial state is no longer tolerable, nor negotiable, for many Palestinians. Rather than fight over crumbs on the table, many Palestinians are beginning to endorse a one-state solution with more vigor, look toward the anti-Apartheid struggle for guidance, and have increased calls for boycott, divestment, and sanction against the state of Israel. After 61 years of dispossession, 42 years of occupation, and the institution of an advanced system of Apartheid, a new generation of Palestinians are proclaiming that they are not helpless victims in need of a Western interlocutor, but a self-empowered people that will see the dessert bloom on the basis of freedom, equality and justice for all. That is not the Netanyahu or Livni plan, nor is it the Abbas or Obama plan. Yes, the settlements must stop growing but so must the imaginary hope that the Palestinian people are going to give up their fight for a free and equal democracy in Israel/Palestine.